1) We have Blue Channel (the number one dive and snorkel spot on the island) right in front of the Villas, Turtle Crossing approx. 400 yds west of us and many many more dive sites very close by. 13) We have the greatest location on the island and it is our goal to make your Roatan vacation stress free and relaxing! Please join our Facebook page and see each photo album of our guests enjoying themselves during their stay at Villas del Playa. We care! 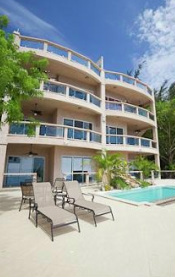 Located right on the beach on the beautiful island of Roatan. Surrounded by the second largest reef in the world. gift shops, grocery stores, and night life are. to the beautiful West Bay Beach. Villas Del Playa offers 6 unique Custom Villas, located on the beautiful sandy beaches of West End. Each villa offers 180 degree views overlooking the turquoise Caribbean sea, breathtaking sunsets, passing cruise ships, overlooking the spectacular and famous “Blue Channel” diving and snorkeling spot on the reef, each just steps from your own villa. Nestled in a quiet location where the tropical forest meets the Caribbean, close enough to walk to West End Village but far enough to get away and enjoy the stars in peace. Deep water access is available directly in front of the villas for large boat and sailboat moorings. The villas offer the ONLY property on the West side of the island with private boat docking and handicap access. The Villas are walking distance or a short water-taxi ride from our dock to the beautiful West Bay beach. Construction of Villas Del Playas features the use of highest quality materials available to insure your investment. All Villas will have the unique use of tempered glass on the balconies for a “Clear View” of the Caribbean Sea and panoramic view of Blue Channel Reef. The best in stone/granite, stainless steel appliances and fixtures, water purification system, 10’ ceilings, and we are wheel chair friendly with 36" doorways. The Honduran Government requires that all visitors entering the country from the US or Canada have a valid passport with an expiration date of at least 6 months past their departure date. Travelers with passports from other countries may have have different visa requirements. PLEASE CHECK YOUR PASSPORT BEFORE PROCEEDING WITH YOUR BOOKING, AS TRAVELERS WITH NON-COMPLYING PASSPORTS WILL BE TURNED AWAY AT THE AIRPORT.